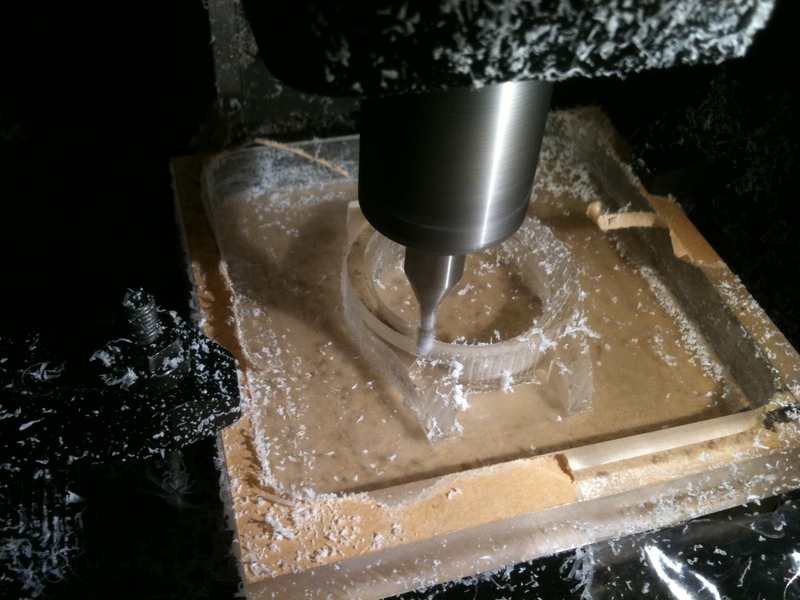 When I bought my milling machine, I was limited largely by the amount of money I had to spend, my understanding of what I wanted to do, and my limited (at the time) understanding of what different mills were capable of doing. I will try and break this down in to a few basic criteria, though ideally a workshop would have multiple machines with each one appropriately tasked. The key to this is knowing what each machine is capable of, and what is needed for each operation required..
as an example, for making a mainplate, ideally you need something that is capable of accurately pointing/drilling the holes for all of the jewels, screws, pins etc, as well as a machine for milling all of the recesses for the wheels, levers etc.. for making wheels and pinions a rigid machine that has precise angles and indexing capability (the ability to rotate a precise angle to form the right number of teeth on each wheel and pinion) and also able to hold the correct cutters. At the time I believed the Sherline could fill all these requirements and more!! 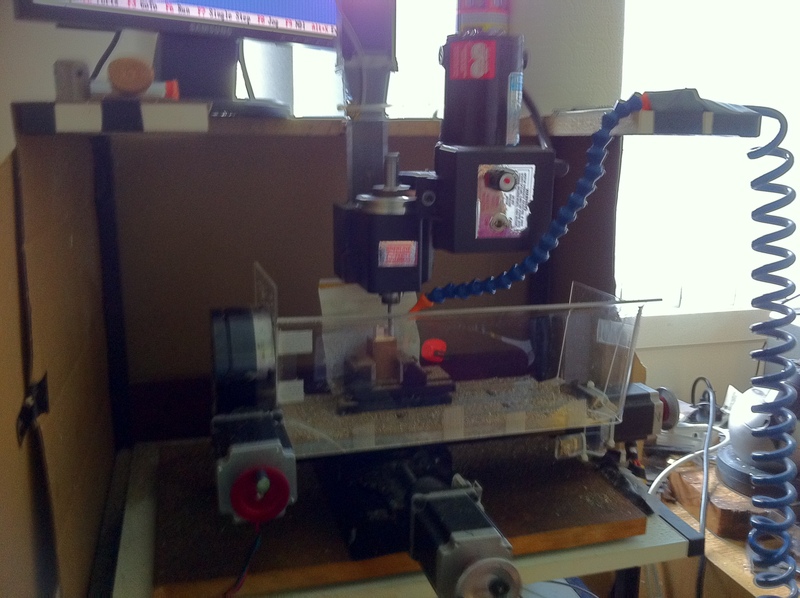 I opted for a CNC version as I have a decent understanding of electronics, and liked the idea of programming it and letting it rip!! 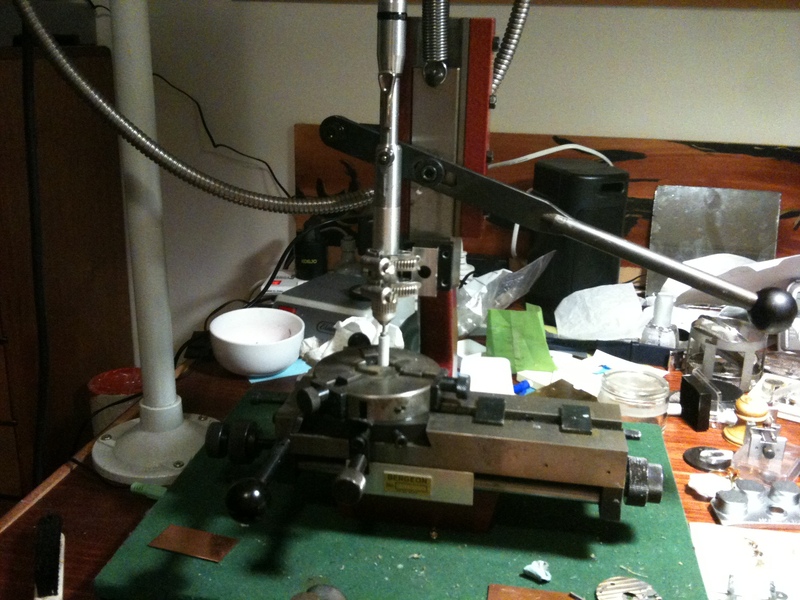 With around 7 years of tinkering with the mill I have a much greater understanding of what the machine is capable of, and while with a large amount of work it could perform all the duties I want of it, it would probably not be worth it in the long run. 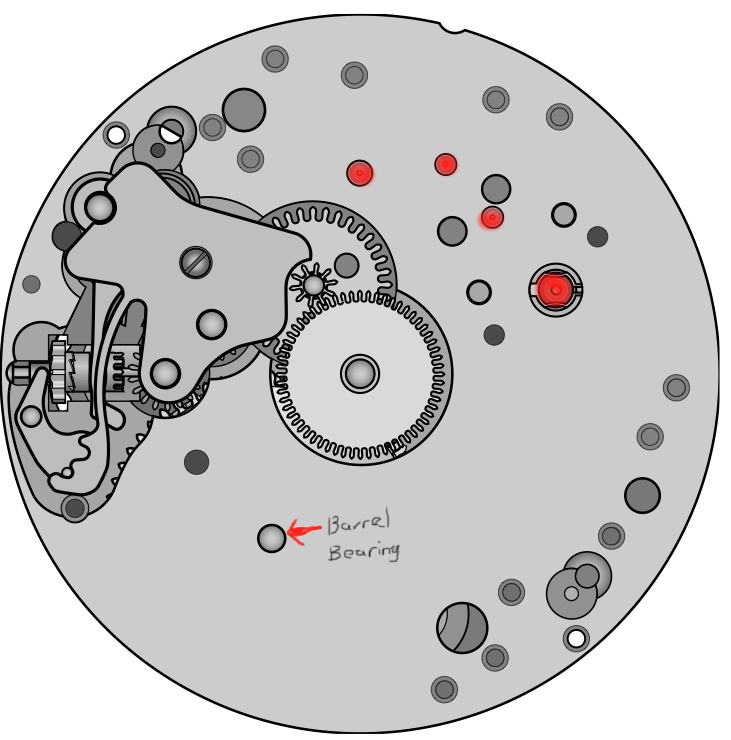 Of course the mill is only part of the equation, ideally a number of lathes would also be desired for the ideal workshop, notably a Schaublin 70.. using this for all turning operations, items can be transferred between this and at least the Aciera, as they share the same tooling.. 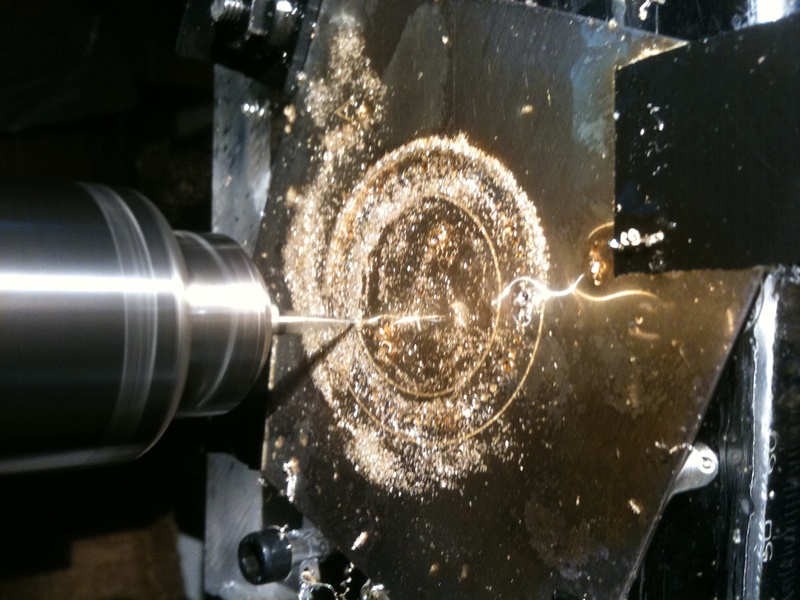 The ideal milling machine is incredibly rigid, so that even at the extremes of its travels there is no flexing of the mill axes, which would create inaccuracies in the process. 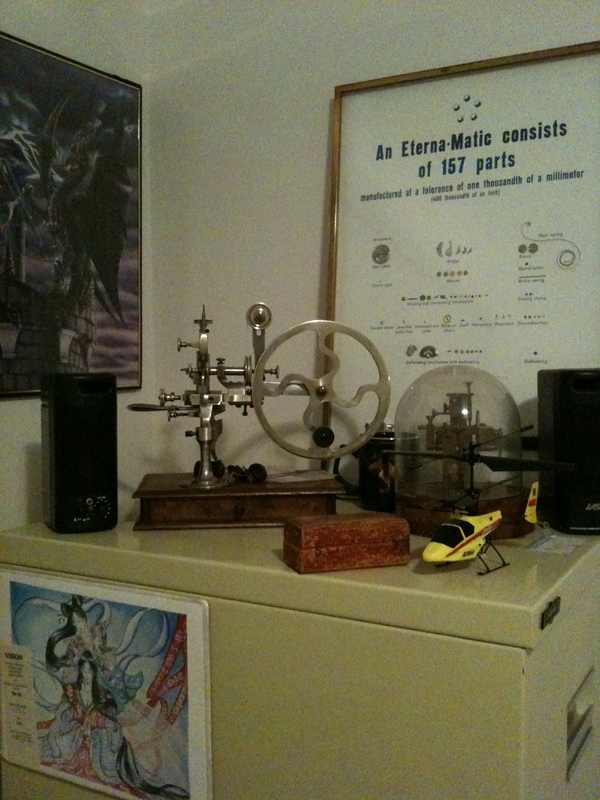 My sherline has issues in both of these departments, it is largely made of aluminium, which has (for something made of metal) a larger amount of flexibility than cast iron or steel, as well as this the way the spindle is mounted has its own issues as well… There are now ballscrew kits available for my mill, though the cost is fairly prohibitive given the initial cost of the mill..
At the end of all this, the milling machine I have is the best I could get for the money I have spent on it, and the things I have learnt while using it will stand me in good stead for when I am able to afford my ideal trio..
After a quick clean of all of the bits, the movement ticks along nicely, all I need to do is fit the dial and hands to the movement, then this group into the case and figure out how to hold it all tight..
To attach the dial to the movement with the least possible fuss, I line up the crown on the movement and case, and use rodico (watchmakers blu-tac) to get the dial as close to upright as possible. 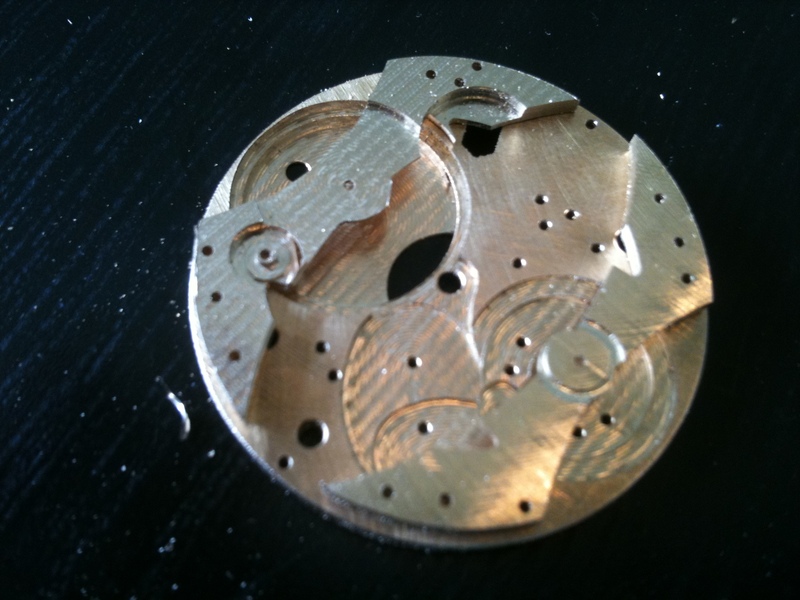 Once I get it as close as I can, I drill 2 holes through the already existing holes in the dial through to the movement, and place 2 screws through to hold the dial in place, when I test the movement/dial into the case it is thicker than I can use, so the gold layer has to be removed, this lets the register ring sit flat against the movement. 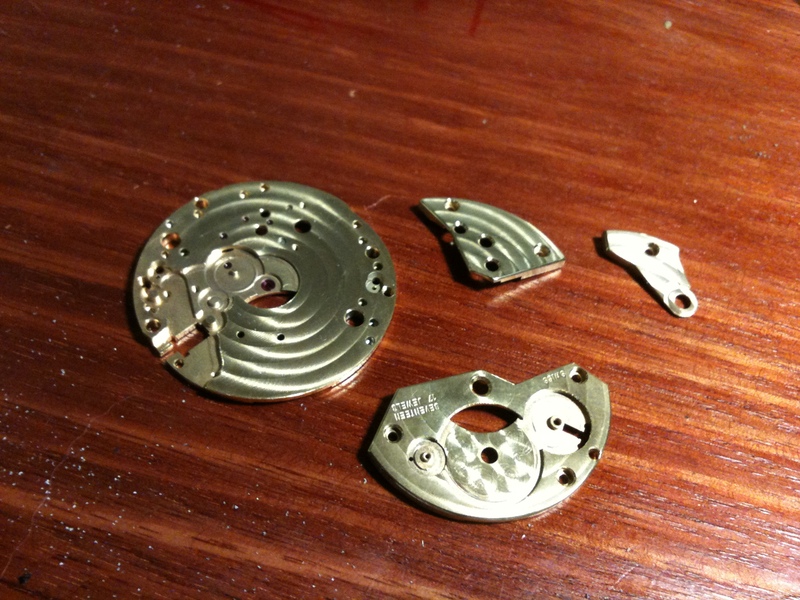 A quick clean up of any debris that got where it shouldn’t, all the screws checked a few times, and the movement is secured in snugly. 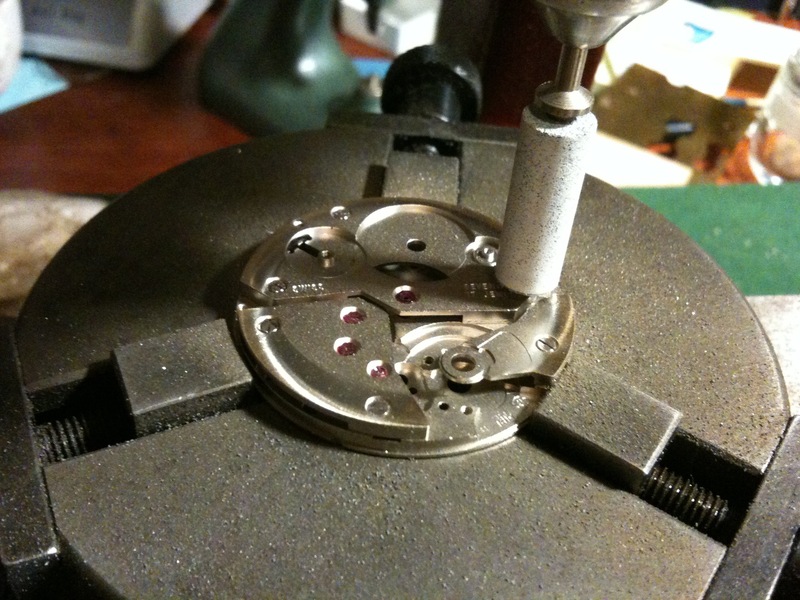 I fit the case back, loctite all of the case bolts, another quick look… Undo all the bolts, remove the case back and the hair that had slipped in, repeat the process a couple of times, and the watch is basically done! Movement…. not so check.. 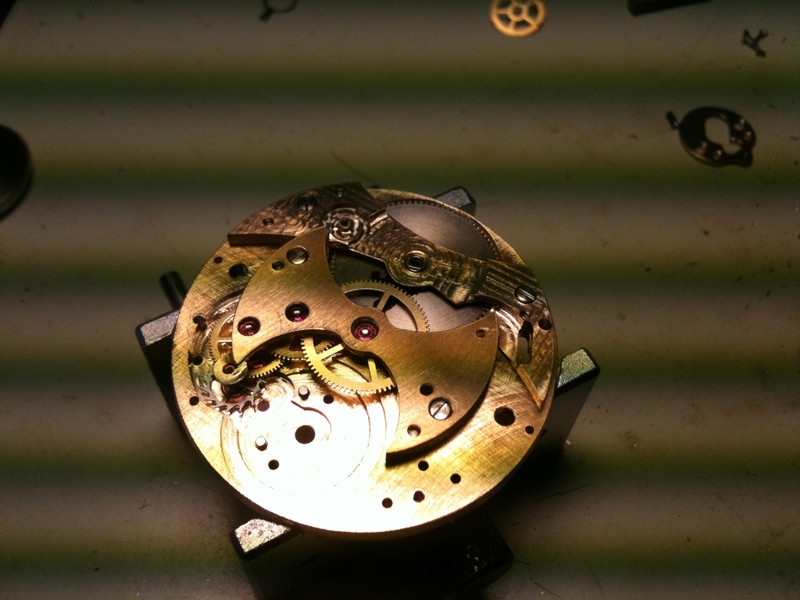 I can’t put one of the bare non-decorated ETA movements in to this piece, I figure either geneva stripes or a spotted pattern would work nicely. 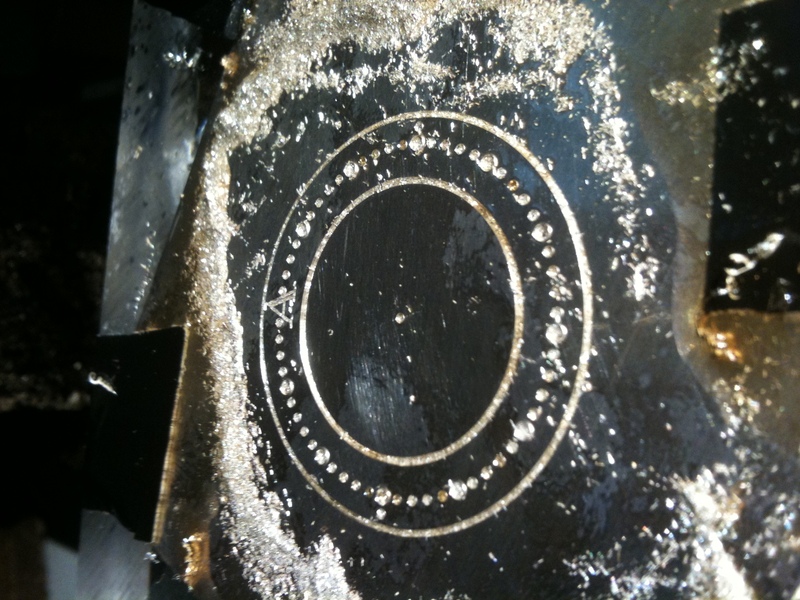 Having experimented with these patterning methods, I know that I will either have to use an abrasive material impregnated tool, or something like a piece of wood charged with an abrasive like diamond paste or similar, and I do have some silicon polishing bits that should fit the bill nicely. 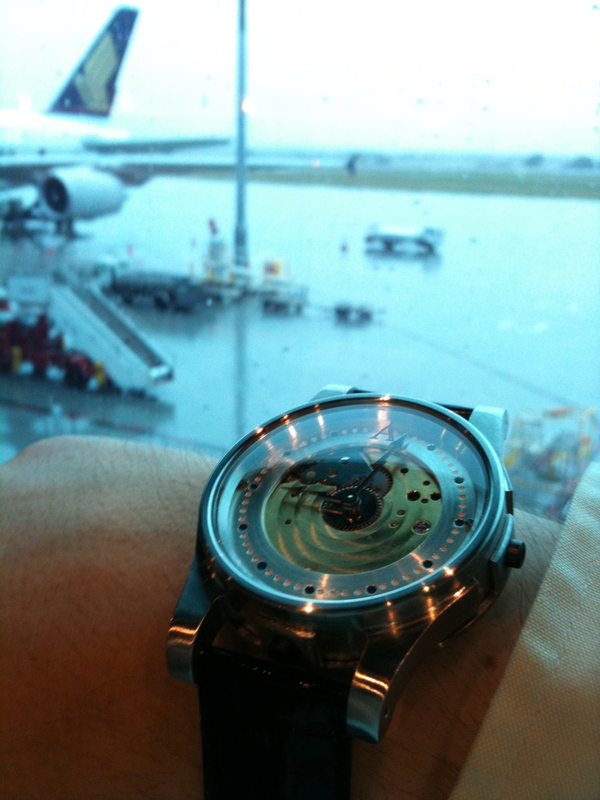 To do Geneva stripes the movement plates have to be held in a vice that can slide backwards and forwards in straight line, while applying pressure with the abrasive, for this there are dedicated machines available, though I don’t know if any of these are located in Australia, and I certainly couldn’t get one fast enough anyway. I had previously experimented doing striping with a large milling machine and discovered that for the best results I needed to be able to control the pressure placed on the abrasive, milling machines don’t do this well.. A drill press would work nicely for this, but I don’t actually have one, not helpful.. 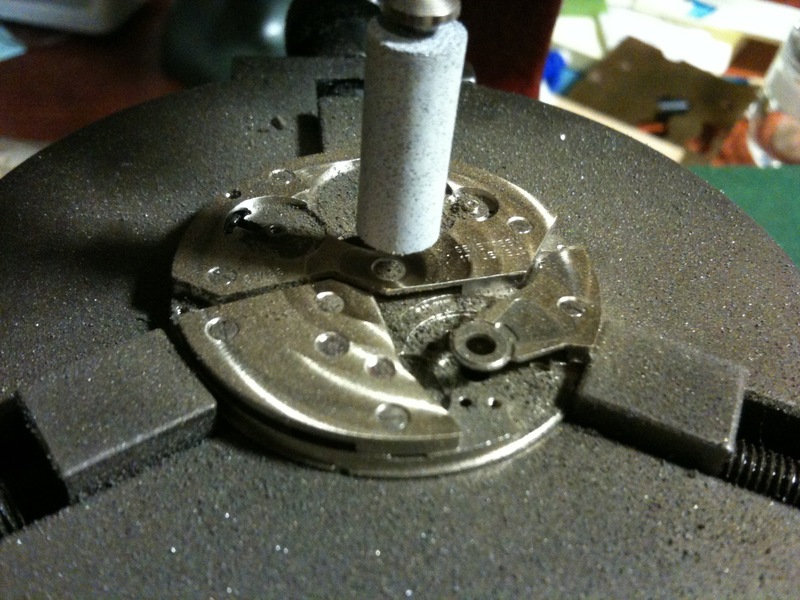 I was able to jury rig up a combination of a jewellers hand piece (for drilling etc) attached using a variety of bits and pieces to a dial stamping machine, this machine has a sliding base, with a spring loaded handle to control the pressure, while my foot controls the speed of rotation.. Still not the ideal machine, but should work for one set of plates at least.. 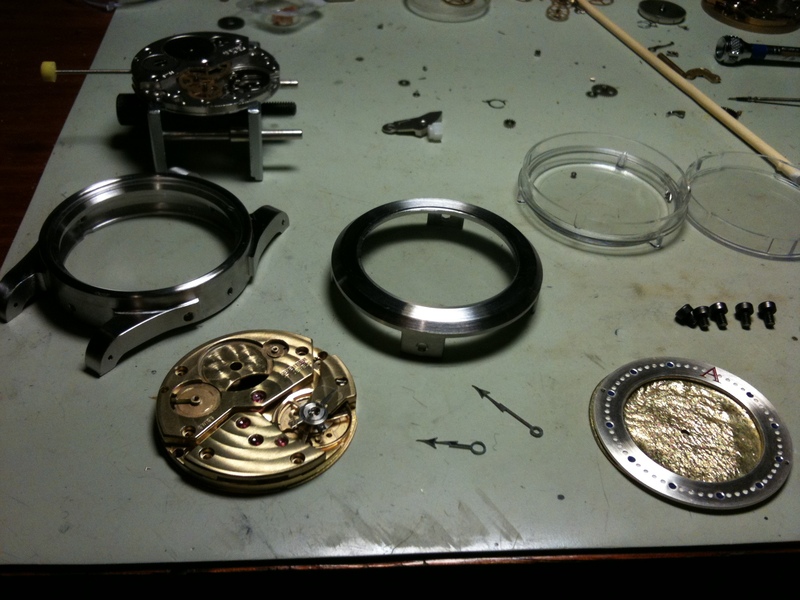 I place the plates where the dial would normally sit and do a few test stripes, but can’t make it all the way across the movement before I run out of room to move.. Unperturbed I turn the dial holding platform allowing me to do circular Cote de Geneve! 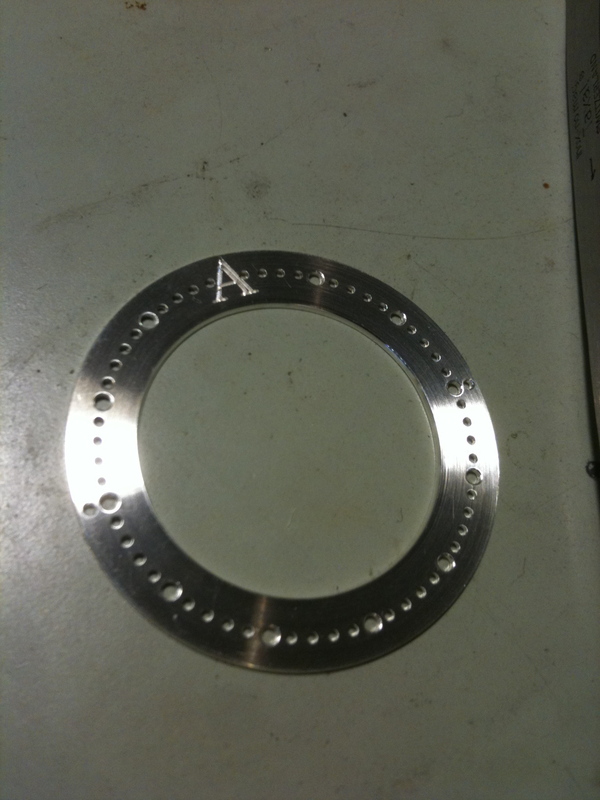 with a few tests I get a pattern that looks good, and is repeated on the mainplate front and back, and the top of the bridges. 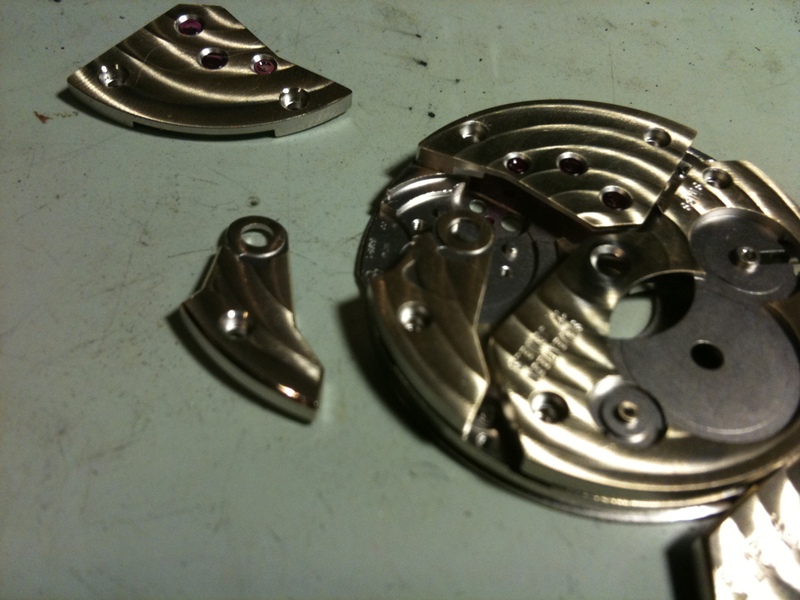 As the abrasive has ground off the rhodium plating that was coating the movement, leaving it a little messy.. 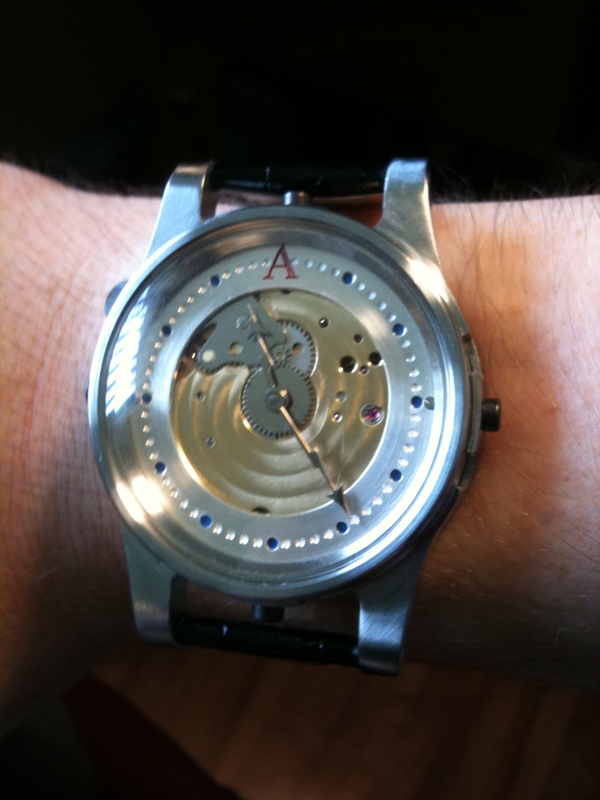 The movement is re-assembled and set back to ticking! 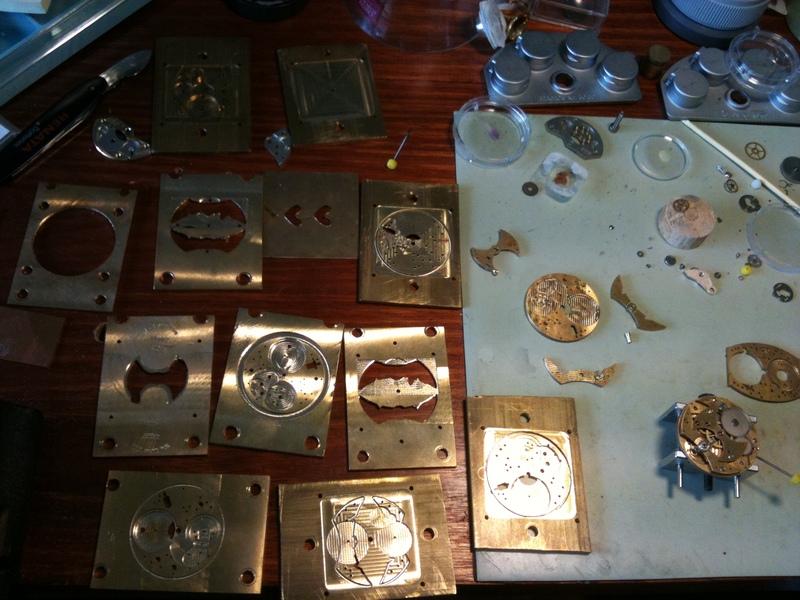 All the bits and pieces, ready to make into a watch! 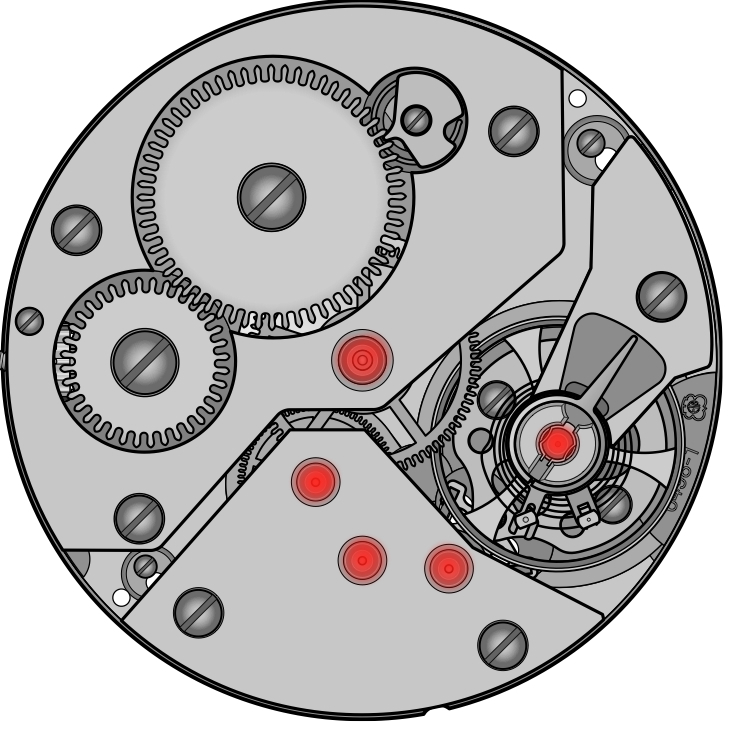 Now that the majority of the components are playing nicely together, it’s time to get this machine to tick! 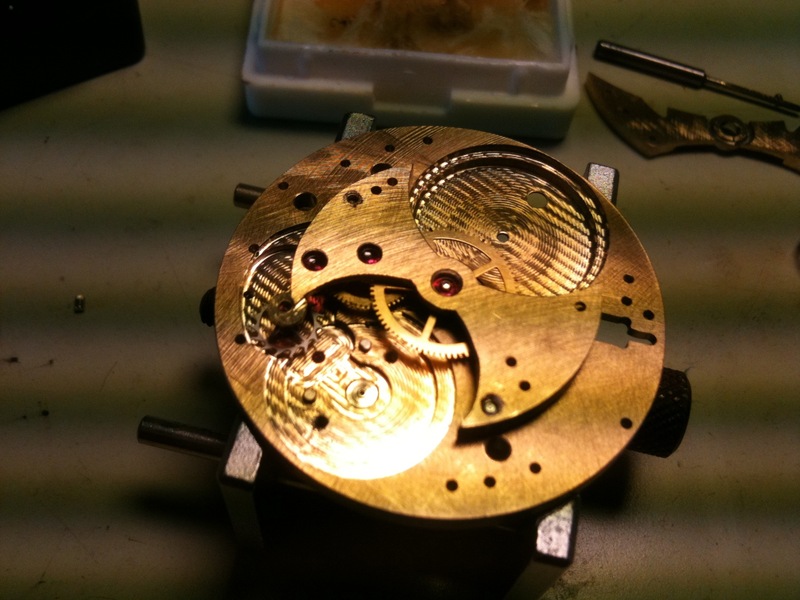 The most difficult part of this operation is removing the balance from the old bridge, and transferring it to a new bridge without damaging the hairspring or the small parts on the bridge itself. 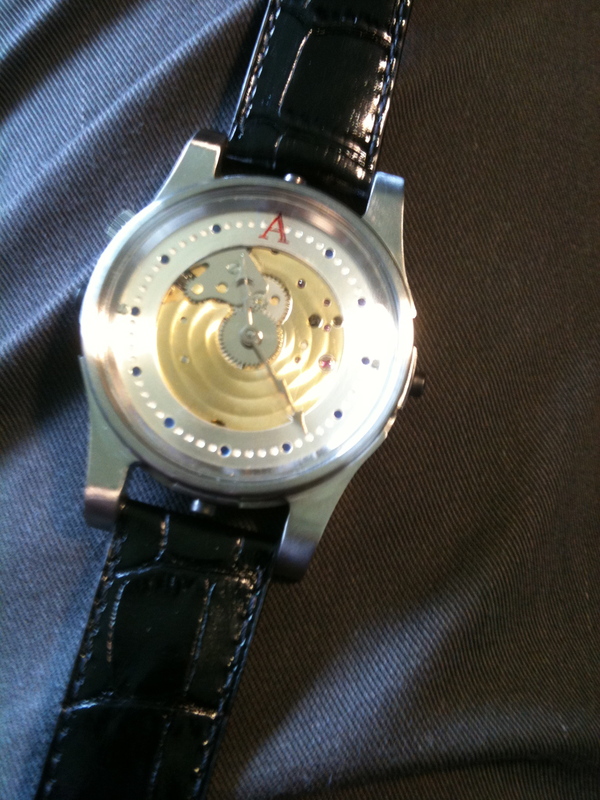 Part of the reason for this is that ETA now use their own method of holding the balance to the rest of the watch, this is done with a specially shaped stud, held in tension between a “fork” of metal, this in comparison to the traditional method of a cylindrical or semi-cylndrical stud, held in place with a small screw. 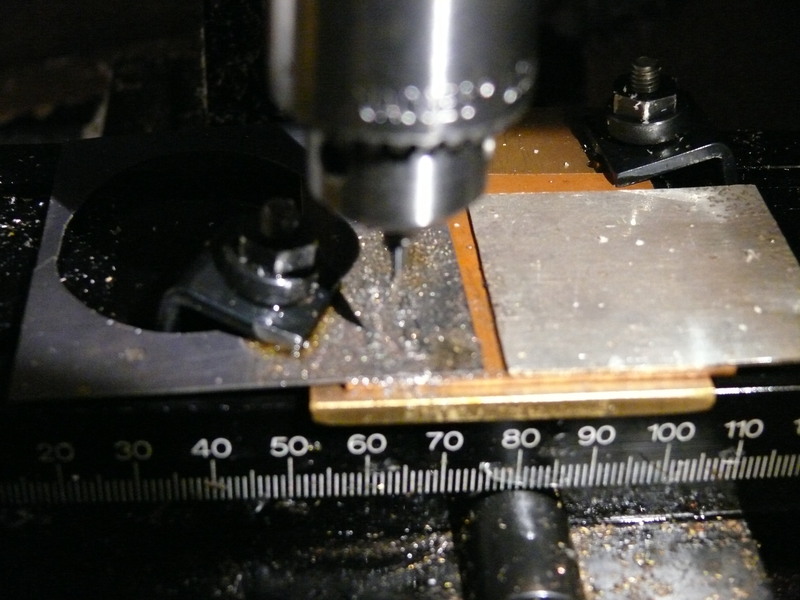 The ETA method is more efficient in that the height of the stud is set permanently, and is non-adjustable, but usually requires the purchase of specialised (expensive) tools to do otherwise straightforward operations. While my method is definitely not the recommended method, it works most of the time.. With a quick flick of a screwdriver the balance assembly is free from the old bridge. The components needed are removed from the old bridge and placed on to the new, and not too surprisingly I can already see some issues.. the first being that the seating for the regulator assembly is a little high, which some quick filing fixes. 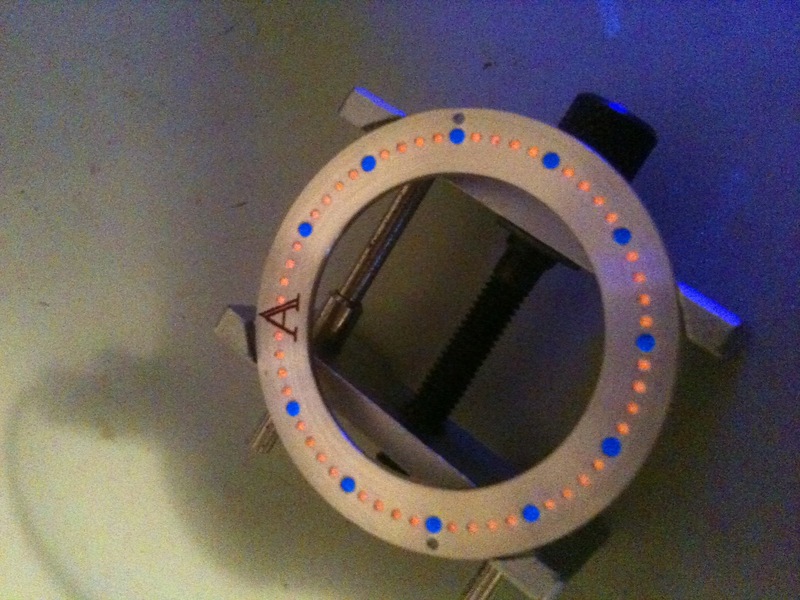 The balance is fitted to the stud holder, (noting that the hairspring will have to be rotated at some point). 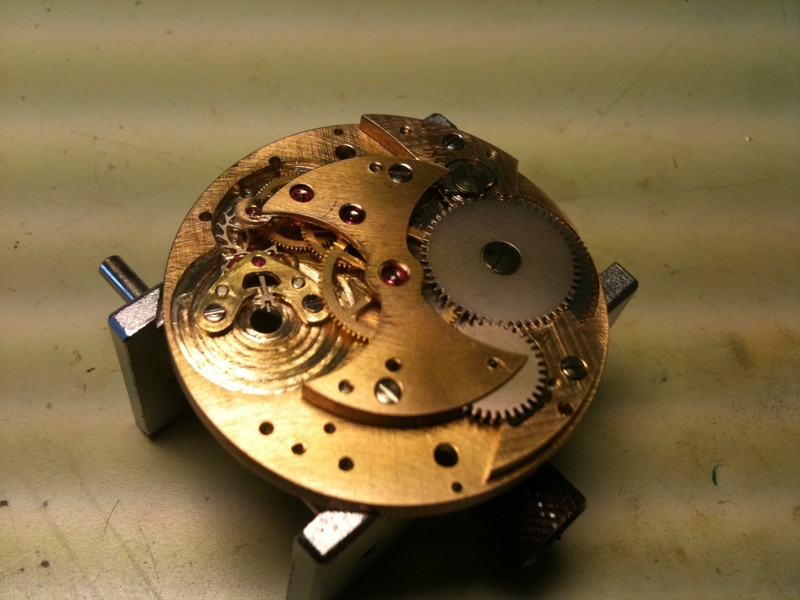 I place the complete assembly into the movement, and try and wiggle the balance wheel into position. No amount of cajoling, tapping or swearing works, as the balance wheel is trying to occupy the same space as one of the train wheels.. Not happy.. The options I have at this point are to adjust the position of the train wheels, re-machine all the plates and hope the next iteration has everything in the right place, make a new balance wheel, or fit the rest of the components to the watch (remainder of the winding mechanism), decorate a base 6498 and case that. The first option was removed from my choices by simply not having the metal needed to complete another full set of plates, combined with the possibility of something still not working and my deadline rushing up.. The second option while briefly attractive, would require some items for my lathe that I don’t own, and some stock material suitable. The third option it is! So the things I need to do while reduced is still fairly significant. 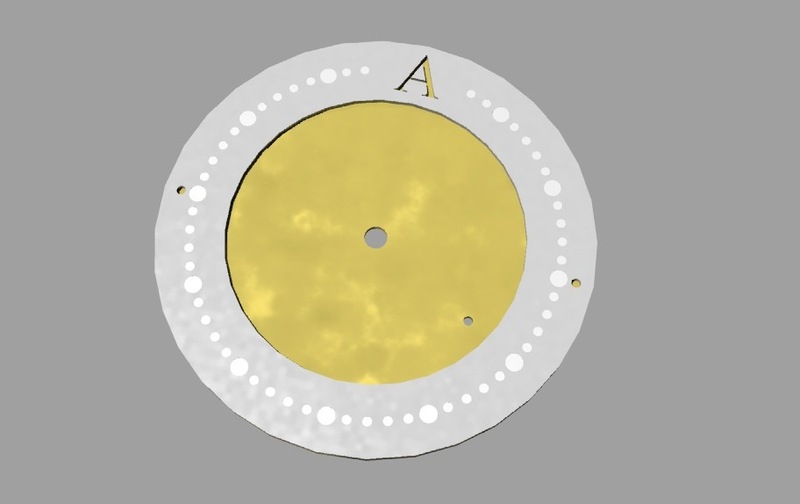 While having a movement is great, it really needs somewhere to live, so I started down the path of designing a home for my little brass machine. 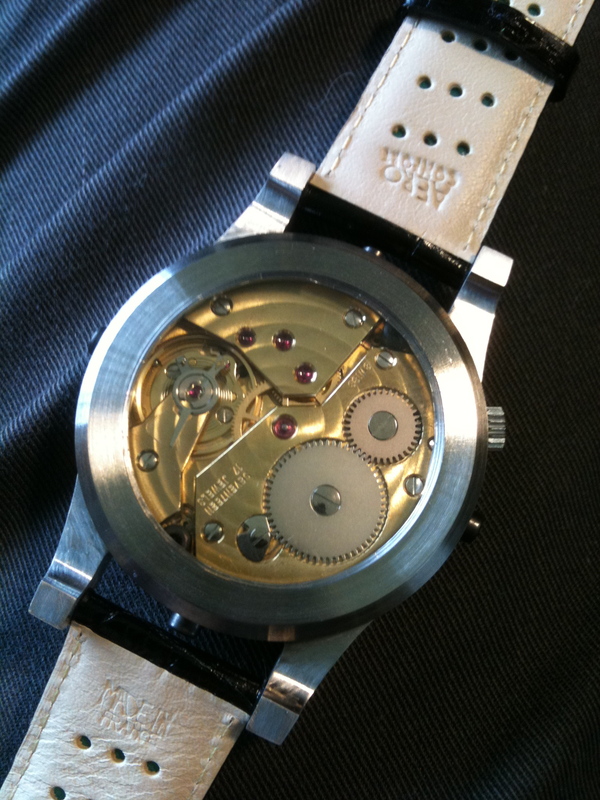 My main criteria for the case is that it adequately protects and allows good viewing of the movement, and wears comfortably.. ideally some water resistance would be nice. I have taken some cues from an industrial context, and made the case quite solid, especially on the case horns (where the band attaches) as this is quite often where cases are damaged and need re-finishing. 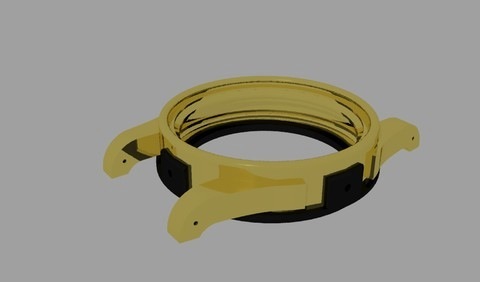 I also have designed the case with rapid prototyping in mind, this way I can have the case made in a variety of materials, and even do combinations, for my renders I used a gold case with an ABS plastic case back, but silver or bronze is also quite a possibility. This process, also called “3D printing” is where a model is built layer by layer using a combination of a material and also a “filler” that is placed anywhere there would be a void. 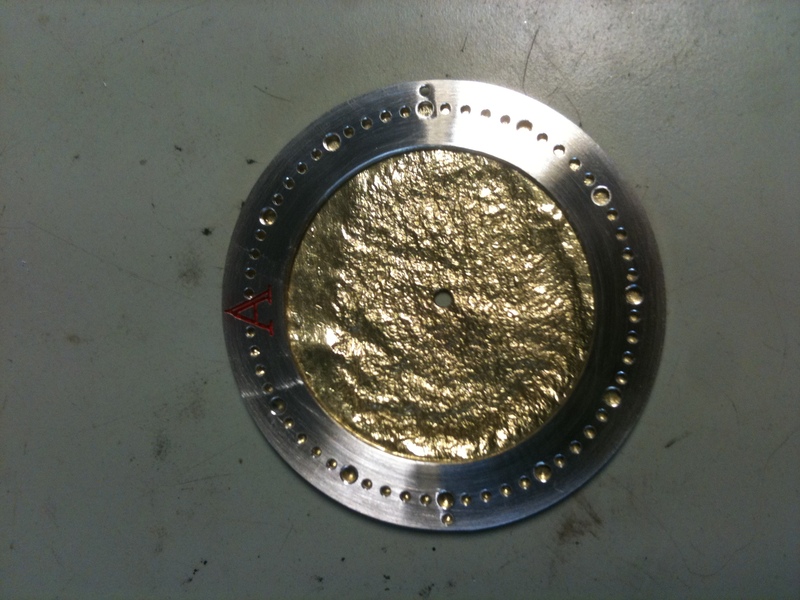 Once the model is finished, the filler material is quite often just blown away with compressed air, leaving the finished piece. 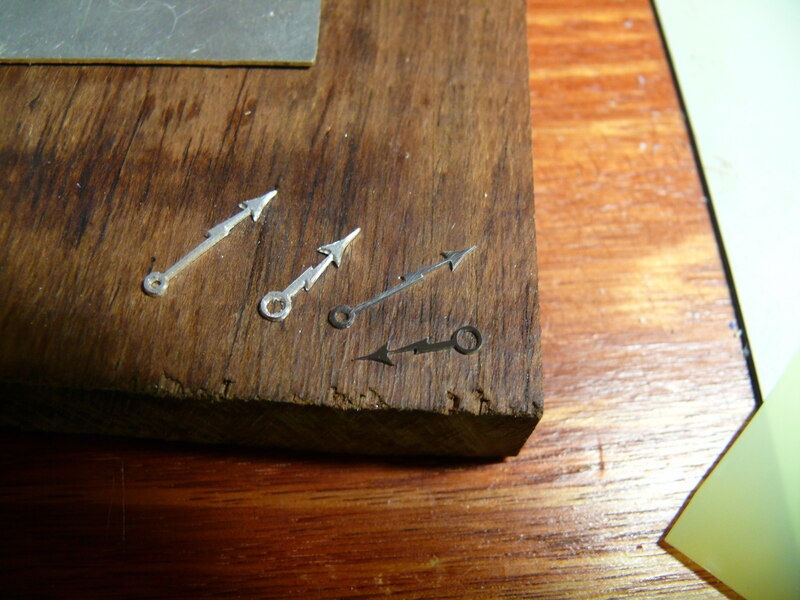 Over recent years, the materials able to be used in this process have become quite varied, from a brittle yet very detailed wax, which is able to be used for casting in precious metals, to a stainless steel based powder that can be sintered into a solid steel object, though the minimum thickness of the steel is about 1-2mm vs .1mm for the wax. A variety of plastics can also be “printed” including ABS plastics which are quite strong and durable. To secure the case main and case back I plan on using 4 bolts or screws, inserted from the sides, top and bottom of the case. 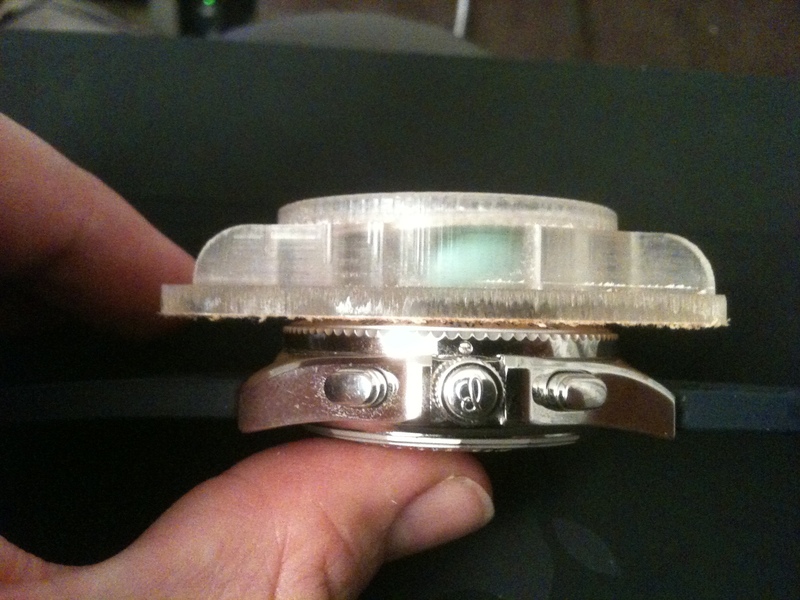 The front crystal is going to plexiglass (plastic) to begin with, as this will show how many times I hit the case on the front, as plexi marks easily, yet doesn’t shatter, I will look into fitting a domed sapphire crystal when I find a supplier at a reasonable cost. The rear crystal will be a mineral crystal to begin with to be replaced with sapphire at some point. 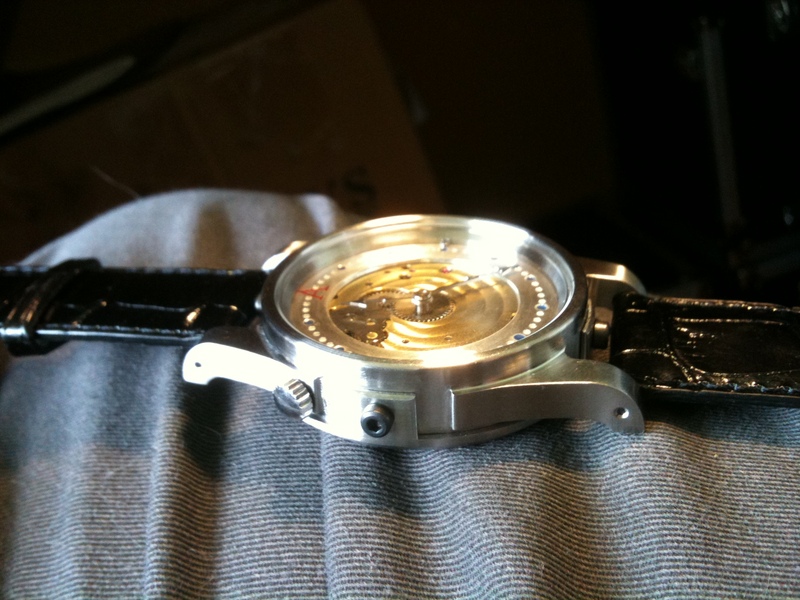 While getting quotes to have the case made in either wax or ABS plastic, I decided to mill a prototype of the front of the case, just to see if it looked at least partly ok, the only issue I still have is that the watch is fairly large. 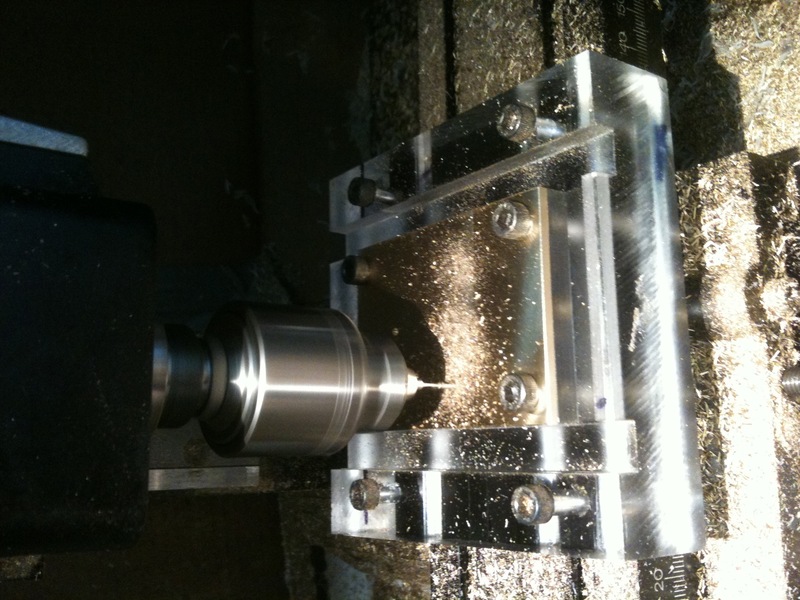 While getting quotes for the rapid prototyping I came across a company that could machine my case instead from solid metal, so I also obtained a quote for this service. 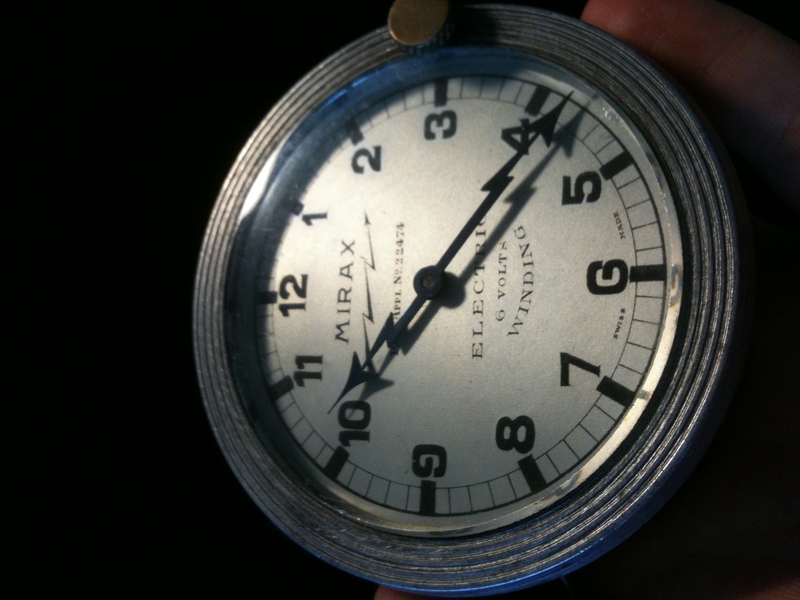 When the quotes came in, there was not a lot of difference in price between getting the case machined in steel, or made in a plastic or wax, plus the lead time required was not too long. The go-ahead was given and the process started. 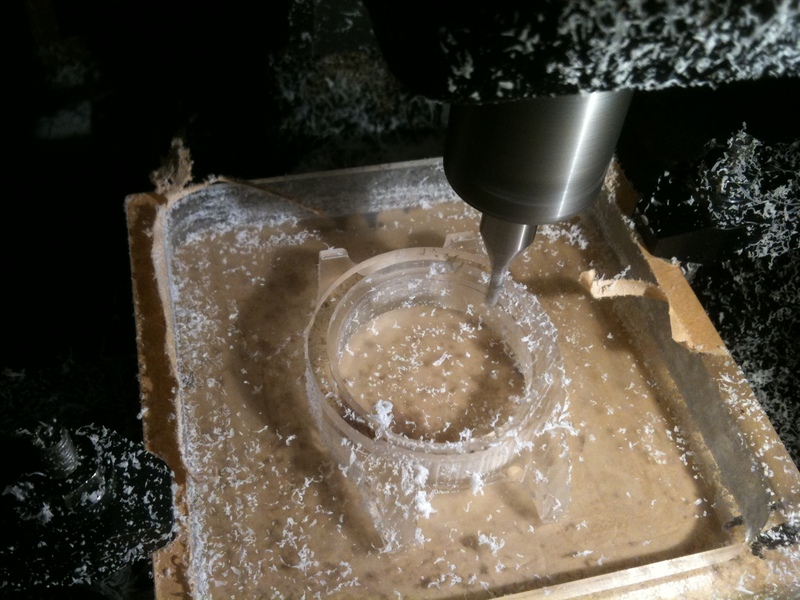 I started machining as soon as possible, a process of around 8 hours solid. only to find that I had gotten confused when translating my measurements to the computer, because of this the recess that holds the barrel was machined too deep, this has the effect of not leaving enough material for the centre wheel jewel to seat into, and also removing some material around the setting mechanism.. Not good! 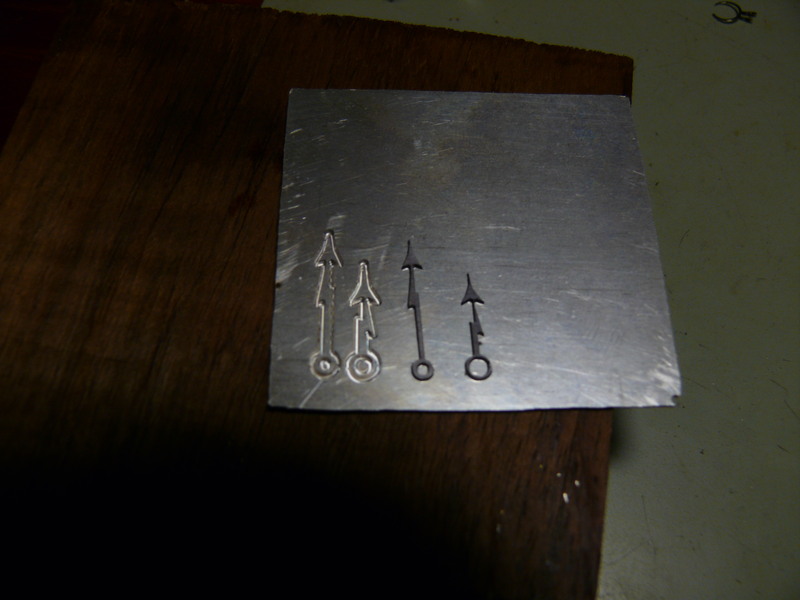 Re-working the machining file and tooling up, I re-made the mainplate, This time the alignment between the front and back was off by about 0.5mm, as was the next one, so I finally figured out a method of lining the front and back of the plate up a bit more effectively. 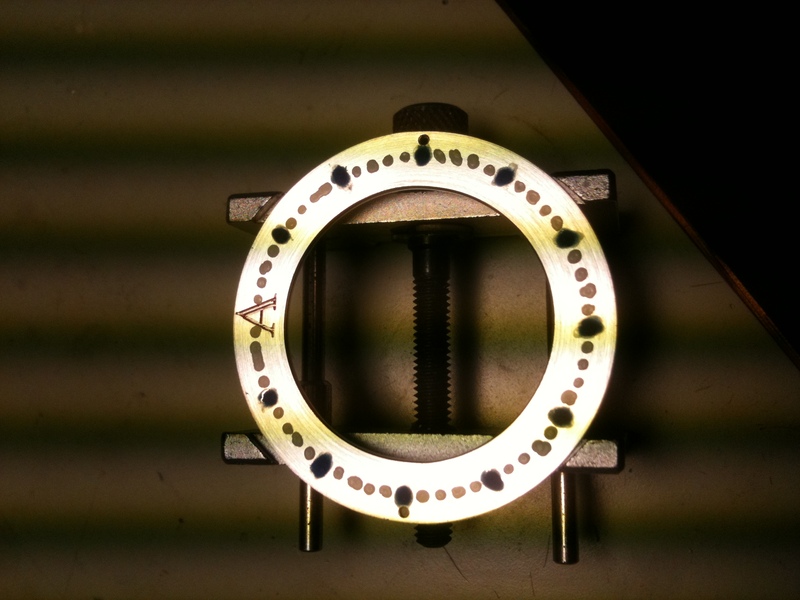 I had been relying on using locating holes in each plate lining up with matching holes in a perspex machining jig. 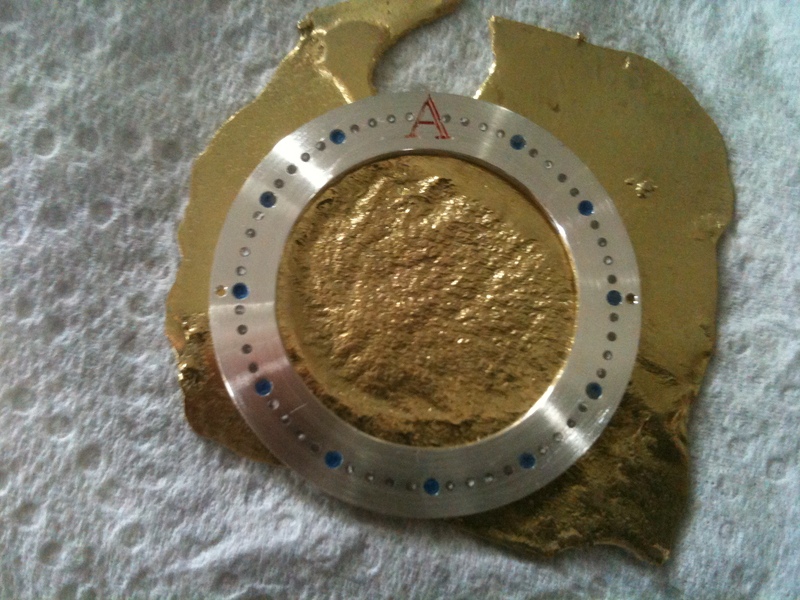 The new method involves moving a tapered point inside holes in the plate, adjusting slightly, moving to the next hole and so on, until the point is in the centre of all of the holes. 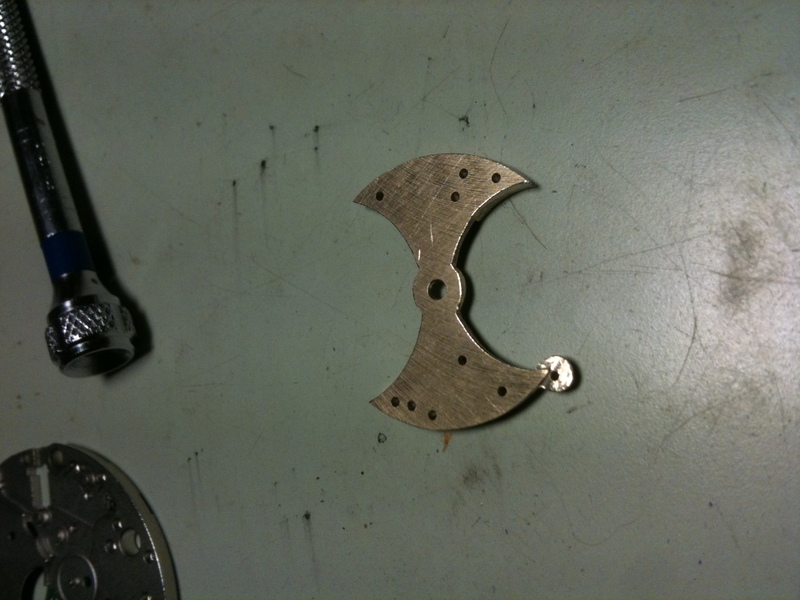 Using this method I machined a set of both mainplate and bridges, all appearing to line up within about 1/10th of a mm. I enlarged all of the bridge hole to the proper sizes for all of the jewels, and fitted them all, then did the same for the train bridge. 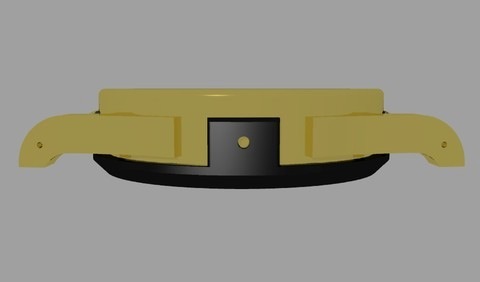 As I test fitted the train wheels it became apparent that something was not quite right, the 4th wheel with the extended pivot for the small seconds hand would no longer fit through the jewel. After a quick modification and removal of the long pivot, the wheel would fit. Success!! 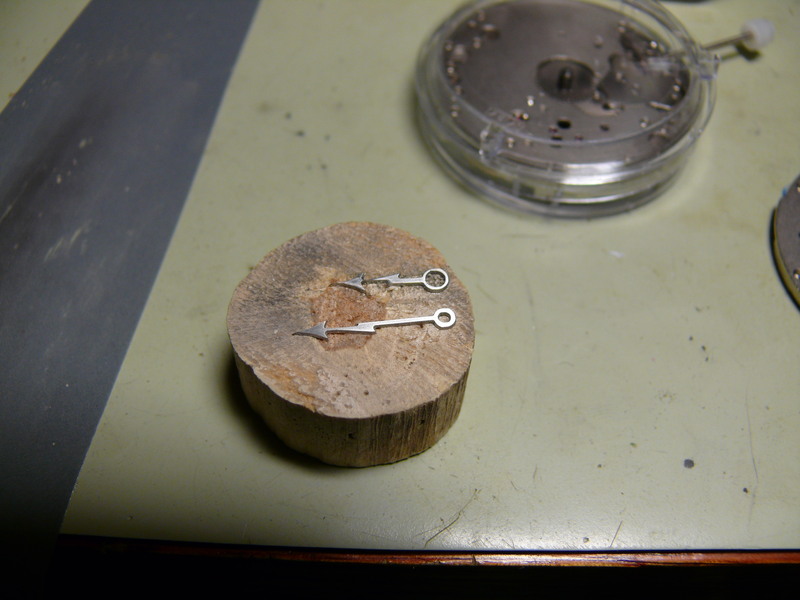 Steady pins were added to the train wheel bridge so that it would locate in the correct place every time, taking a cue from Peter Speake-Marin I made these pins tapered, so that as the bridge is lowered it fits neater than if they had been completely parallel. 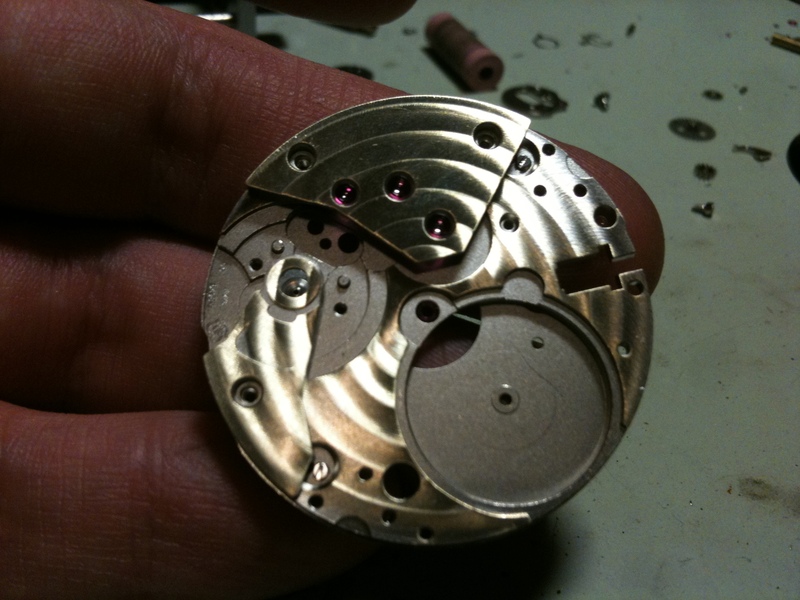 The original movement uses large (2mm outside diameter) jewels on the bridge side of the movement, and small (1mm outside diameter) jewels on the dial side of the movement, while this has little functional effect, I prefer to have nice beefy jewels on both sides, as it looks much better, and I had a few spare due to the number of movements I had bought. 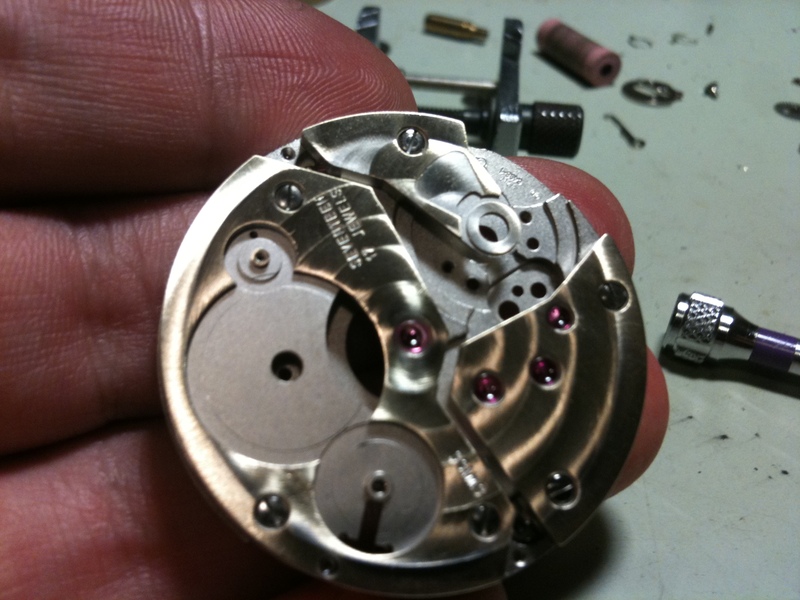 The original movement uses the manipulate itself as the lower bearing for the barrel and this is a common wear point for many watches (looking at you Seiko.. and early Rolex as well..) I decided to replace this with a jewel (coincidentally the same pivot diameter as the centre wheel) although I haven’t found a jewel large enough for the upper bearing, I will use a bronze bushing for this, which at least can be easily replaced. Because of the way I had moved the train around, the setting mechanism would no longer fit in the orientation that it was originally used, luckily (again) the 6497 and 6498 use a mirror image of the setting mechanism, and with some juggling, I found a spot where everything appeared to play nicely. 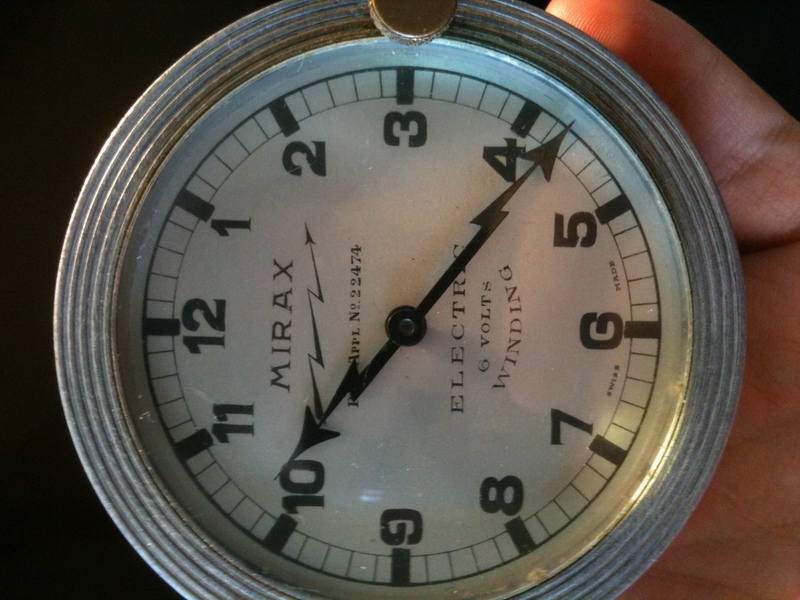 Over the Christmas break I also caught up with a number of friends, amongst whom is a retired engineer who’s father was a watchmaker, he showed me an old electric car clock, and the hands immediately took my fancy, I knew straight away that these shapes had to end up on my watch.